PLANNING NOW available! A Futures and Estate Planning Guide for Families of Children and Adults with Disabilities | Service Coordination, Inc.
An updated version is now available! 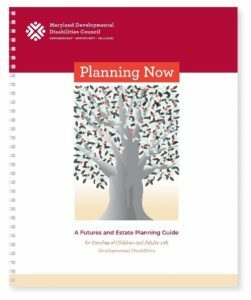 Planning Now is a comprehensive, easy to use futures and estate planning guide for families of children and adults with developmental disabilities. Future & estates planning includes envisioning a desired future for your child. Topics covered include financial and healthcare benefits, wills, trusts, tax considerations, financial planning, and others. The Council has a limited number of hard copies available. Contact us at info@md-council.org or 410-767-3670 to request copies. The Spanish version is coming soon! Use this flyer at events and help spread the word and make sure families know about this important resource! Planning Now discusses the importance of planning and provides essential information, suggestions, and a framework for planning. Get started now!